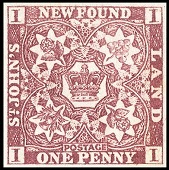 Newfoundland stamps first appeared in 1857. Though simple in number and appearance, the first issues of Newfoundland went through a very complex evolution, until the designs were abandoned in 1862. 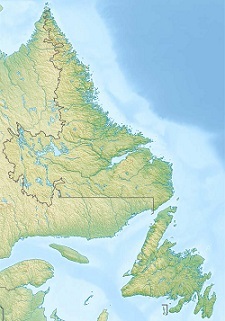 The Colony of Newfoundland and Labrador, as it was officially known, was composed of the Island of Newfoundland, in the Gulf of St. Lawrence, and Labrador, on the mainland, Northwest of Newfoundland. Most of the population resided on Newfoundland Island. The etymology and history of the establishment of this important colony is rather diverse. The Norse first visited the coast of Labrador at the beginning of the 11th Century, but they did not establish any permanent settlements there, or at least none that have survived there. At the beginning of the 16th Century, many Portuguese, Spanish, French, and English explorers began to discover the vast fishing resources around Newfoundland Island. Fishermen began to make seasonal voyages there to fish the waters around Newfoundland Island for Cod. The French and Spanish explorers referred to the Island as the "New Land", which eventually became "New Found Land" in English. The mainland territory to the Northwest was visited by the Portuguese explorer, João Fernandes Lavrador, in 1499, and it became known as "Labrador". In 1583, Sir Humphrey Gilbert, claimed Newfoundland as England's first overseas colony, under a Royal Charter from Queen Elizabeth I, thus beginning the creation of what would eventually become the British Empire. However, the first permanent English settlements were not established there until 1610, when John Guy landed with 39 colonists. Newfoundland remained a British colony until 1949, when it became a province of the Dominion of Canada. 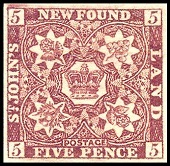 The nine Pound Sterling currency Newfoundland stamps shown above were issued in 1857. The designs feature a Rose, Thistle, and Shamrock, arranged in varying frames. These stamps are imperforate, engraved, and they are printed on unwatermarked, thick, porous, wove paper with a light mesh over-coating. 1 P. (1857 - Scott #1) - Brown Violet. 2 P. (1857 - Scott #2) - Scarlet Vermilion. 3 P. (1857 - Scott #3) - Green. 4 P. (1857 - Scott #4) - Scarlet Vermilion. 5 P. (1857 - Scott #5) - Brown Violet. 6 P. (1857 - Scott #6) - Scarlet Vermilion. 6 1/2 P. (1857 - Scott #7) - Scarlet Vermilion. 8 P. (1857 - Scott #8) - Scarlet Vermilion. 1 S. (1857 - Scott #9) - Scarlet Vermilion. Some of the first Newfoundland stamps were re-issued in 1860. The re-issued stamps are printed on thin to thick wove paper WITHOUT the mesh over-coating. Some of the colors are a little different but the key to determining these stamps is that they have no mesh over-coating. 2 P. (1860 - Scott #11) - Orange. 3 P. (1860 - Scott #11A) - Green. 4 P. (1860 - Scott #12) - Orange. 5 P. (1860 - Scott #12A) - Violet Brown. 6 P. (1860 - Scott #13) - Orange. 1 S. (1860 - Scott #15) - Orange. 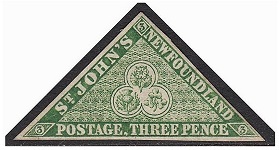 Some of the first Newfoundland stamps were again re-issued beginning in 1861. These re-issued stamps are the same as the 1860 printings, but the colors are different. 1 P. (1861 - Scott #15A) - Violet Brown. 1 P. (1861 - Scott #16) - Reddish Brown. 2 P. (1861 - Scott #17) - Rose. 4 P. (1861 - Scott #18) - Rose. 5 P. (1861 - Scott #19) - Reddish Brown. 6 P. (1861 - Scott #20) - Rose. 6 1/2 P. (1861 - Scott #21) - Rose. 8 P. (1861 - Scott #22) - Rose. 1 S. (1861 - Scott #23) - Rose.